On Thursday 7 December at 7.30pm, St John’s Chapel, Chichester, you can enjoy a delightful mix of seasonal words and music at a special Festival of Chichester seasonal fundraiser. You can look forward to spending an evening with Dame Patricia Routledge, actor/singing star Gareth Williams, poet James Simpson, actress Emily Rose Smith and the evergreen Jazz Smugglers band – there will even be free mince pies! Held in the atmospheric setting of Grade I listed St John’s Chapel, the Festive Jazz Café is a great way to kick off the count-down to Christmas with mellow jazz classics and entertaining readings. Expect Gershwin, Cole Porter and all your favourite tunes, plus pleasurable and inspiring poetry. 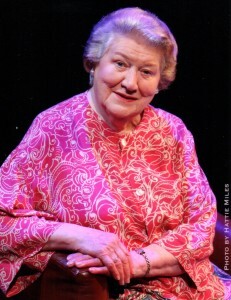 Dame Patricia Routledge is known to millions for her starring roles on television, in film and on stage. Credits include Keeping up Appearances, Hetty Winthrop Investigates and many West End and Chichester Festival Theatre roles. Gareth Williams had a number one smash hit as a member of The Flying Pickets with Only You. His latest film, Peterloo, directed by Mike Leigh, is scheduled for next year. TV/Stage roles include Guys and Dolls, My Fair Lady, Eastenders and Murder in the Cathedral at Chichester. Sussex poet James Simpson will be reading some of his recent works. James is a Jerwood/Arvon Award Winner who has collaborated with the artist Carolyn Trant on two collections, Hunting the Wren and The Untenanted Room. Performing alongside Gareth and James is Emily Rose Smith, whose credits include Goblin Market for Andrew Lloyd Webber’s Sydmonton festival, Canaries Sometimes Sing (London and Antibes), Dr Faustus with Sam West and The Bear by Chekhov during 2013’s Festival of Chichester. As some will know, Katy of Chichester Copywriter manages the website content for Festival of Chichester, for which she’s received a glowing testimonial, and is a firm supporter of the annual local arts event. Do come along to the Festive Jazz Café on Thursday 7 December, the proceeds from which will support 2018’s Festival and make it bigger and better than ever. Tickets: £12; £10 (students). Book online here or call: 01243 775888/816525. This entry was posted in Literature Events and tagged Chichester, Chichester Copywriter, Chichester Festival Theatre, Cole Porter, Dame Patricia Routledge, Festival of Chichester, Festive jazz Café, Gershwin, James Simpson, Jsussex poet, Peterloo, poet, poetry, website content. Bookmark the permalink.